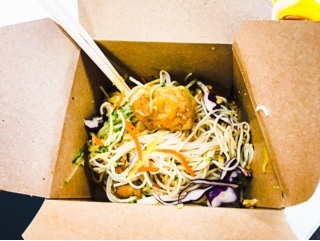 As Uber enrages taxi drivers, they may soon add fast food delivery services to the list. 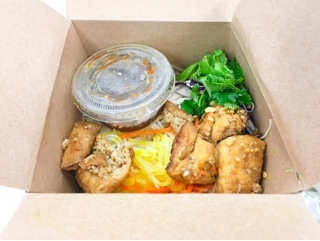 In late 2015, the tech company launched the Uber Eats function, using their drivers to provide food delivery for numerous restaurants across the city. Already being an Uber rider, I decided to test out the new app to take advantage of the $10 credit and free delivery being promoted during the 2015 launch. As fate would have it, Mean Bao (a place I’ve been wanting to try for a long time) was delivering during lunch. Like Uber’s car service, the app was easy to navigate and already linked to my existing account and credit card. In a minute my order was placed with the system providing updates and revised delivery times (earlier than what was originally quoted before ordering). Surprisingly, the driver even met in the lobby of my company’s building; I didn’t need to wait at the nearest intersection as earlier Uber Eats pop-up days had done. The braised beef bao ($3.95) was still warm containing a hefty slab of tender meat garnished with boiled bok choy, Taiwanese pickles, crushed peanuts and cilantro. 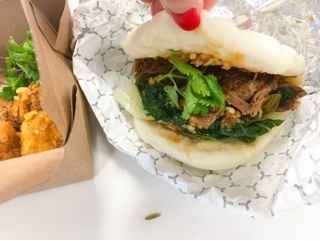 Even with the pickles and nuts, the bao was rather soft, I would have liked more textural contrast (perhaps some carrot slivers or crunchier pickles would help). Nevertheless, the beef was well flavoured and the bao fluffy without becoming mushy. To make it a full meal, the cold noodle salad ($4.95) was a good addition and lends itself for delivery since it’s already cold. Along with the vermicelli were plump fried tofu puffs, julienned carrots, red cabbage and pickled daikon. The soy dressing was extremely garlicky with a hint of chili in the background. Overall, it would have been good if the garlic was toned down as the raw tang simply overpowered everything. At this point, the majority of restaurants are in the downtown area, which is a shame when I need to return home to the suburbs. There has been the occasional juicing service or healthy eatery available during the weekends. Sadly, neither of those appeal to me. For those who are working late or too lazy to venture out of their building, a new savior is in town – let’s hope this doesn’t lead to additional protests and gridlock.